It goes without saying that 2015 marks that year that proximity marketing officially took off its training wheels. Right from leading retail brands like, Macy’s, Coca-Cola and Procter & Gamble to publishing brands like Elle to events like SXSW festival, businesses across various verticals are busy trying to deliver a compelling customer experience by pushing the right message, to the right person, at the right time. At its simplest, proximity marketing is the act of advertising to a customer based on their location. But as more and more proximity marketing campaigns go live, marketers all over are now beginning to realize that there is more to proximity marketing than merely delivering vouchers and coupons. These tools work best when they are used to better understand the needs and wants of your customer base, as well as notable patterns in buying behaviour. In fact, when used properly, proximity marketing can even help you improve customer retention. Over the past year, we have seen businesses leverage various technologies such as Wi-Fi, GPS, NFC and most importantly iBeacon technology, to deliver hyper-local, contextual, and personalized messages to both existing and potential customers. Each of these technologies have their own limitations and in most of the cases, you need to use the right combination of two or more technologies based on your budget and what you are trying to achieve. If your brand has not even begun toying with the idea of investing in proximity marketing, then you should consider this a wakeup call. In this blog we will be discussing a few consumer and industry trends that highlight why investing in proximity marketing is the need of the hour. Whether you are willing to embrace proximity marketing for your business or not, your competitors are definitely going to. 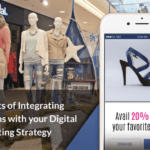 According to the 2015 Store Operations Survey, 29% of retailers already have beacons in stores while 17% more plan to add beacons, which would bring the total number of retailers with beacons to 46%. Adding on to that, earlier this year, BI Intelligence report predicted that beacons will directly influence over $4 billion worth of US retail sales this year and that number will climb tenfold to $44 billion in 2016. So much so that, within five years, retailers are predicted to invest upto $2.5 billion invest in IoT, much of which will be for beacons and RFID (Radio Frequency ID) tags, according to Juniper Research. Today, major retailers are driving sales by presenting proximity based offers and providing engaging real world experiences. These retailers are setting themselves up for long term success through one key factor – big data. The very same factor that drove the success of e-commerce giants such as Amazon by helping them build complex online profiles of their customers. They then used these profiles to send customers the personalized product recommendations that are most likely to sell. (1) Optimize the layout of your store by tracking customer walking paths and dwell times. (2) Use saved data like favorited items, recipes, experiences or entrees to direct users to their desired object inside your store or on your menu. (3) Increase staff performance by utilizing data from a mobile survey pushed to customers as they exit your store. You can check out our earlier blogs to gain a solid understanding of the various in-store metrics that are involved in data-driven decision making. Thus, given the innumerable benefits that come with proximity marketing, unless you invest in it soon, your competitors will use these techniques to steal your business. According to a recent report, ‘Reality of Retail’, from InReality, a retail marketing and strategy firm, 75% of consumers use their mobile devices while shopping in stores. Thus, while you are busy fighting the retail battle against Amazon or other ecommerce giants out there, you are actually losing the attention battle to Instagram, Facebook and even email. The best way ahead is to reach out to your customers on the channel that is most personal to them – their smartphones. And while this may make you think that you need to push more Facebook posts or send more emails, chances are that your message is highly likely to get lost in a sea of never ending noise. This is where proximity marketing comes into the picture – beacons allow you to deliver a relevant push notification to your customer’s mobile screen at the exact moment, that calls for their attention. Thus, as long as they are opted in, customers actually tend to pay more attention to their push notifications. Now, again when it comes to beacon-enabled interactions, it is highly critical that you follow certain nuanced guidelines that align the interests of your brand with those of your consumers and ensure that both parties benefit from personal data collection. You can check out our earlier blogs to learn how you can earn consumer trust by ensuring transparency, when it comes to beacon-enabled interactions. At the Digital-Life-Design (DLD) conference in January 2015, Scott Galloway of NYU Stern stated that “[brick and mortar] stores are the new black in the world of e-commerce”. He stated that going ahead, pure play e-commerce will not work, and that the future of commerce lies in an omni-channel strategy that blurs the online and offline worlds. This is one of the main reasons why pop-up stores have exploded and are currently fueling the retail revolution. In fact, according to PopUp Republic, the pop-up market has grown to become an industry worth approximately $10 billion in sales. If you need any further proof on this strategy, look no further than Warby Parker, the online eyeglass retailer, who, thanks to their offline brick and mortar stores, ranks #2 behind Apple in terms of sales per square foot, in the U.S. Thus, very soon all the benefits (easy returns, personal touch, instant ownership etc.) offered by brick-and-mortar stores will soon be at the disposal of all ecommerce giants. And one of the ways in which brick and mortar stores can fight back, without even dabbling in e-commerce, is by adopting proximity marketing. Are there any other ways in which proximity marketing can help businesses stay ahead of the competition? Let us know in the comments below.